Risk Market Journals deliver academically rigorous, practitioner-focused content and resources for the rapidly evolving discipline of financial risk management. All the journals from this organization will be freely distributed and available from multiple websites. Here you can find information about our editions: descriptions, instructions to authors, online editions, articles in press. 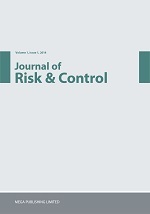 Journal of Risk & Control invites submissions of original research articles in all areas of finance, including financial markets, portfolio choice, asset pricing, corporate finance, alternative investments and risk management. The journal’s cross-disciplinary coverage and applied focus shifts risk and contingency management away from pure financial coverage to all aspects of economic uncertainties. Academicians and researchers benefit by gaining insights from the research in this journal concerning how risk is measured and mitigated against across different disciplines, industries, and sectors. Please click here if you would like to publish your paper with us. 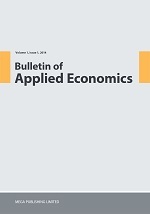 Bulletin of Applied Economics is intended to serve as the primary outlet for theoretical and empirical research in all areas of international economics. These include, but are not limited to the following: commercial policy, international institutions, industrial relations, development economics, monetary economics, public economics, labour economics, energy economics and other timely and concerned subjects. Theoretical work submitted to the Journal should be original in its motivation or modelling structure. Empirical analysis should be based on a theoretical framework and should be capable of replication.